Thank you for choosing Fuzhou AO Magnet Electronic Co.,Ltd. For the past 19 years we've been dedicated to being "your magnet solution source". From our ever-expanding product line, to the best service in the industry, we are here for you, I guarantee it!" As a professional magnet manufacturer, magnet supplier and OEM magnet exporter, AOMag was established in 1996 and specialized in R&D, production and sales of rare earth magnets, permanent magnets, neodymium magnets, Sintered NdFeB magnets (Neodymium-Ferrite-Boron) , strong magnets, bonded ndfeb magnets, ferrite magnets, alnico magnets, Smco magnets, rubber magnets, injection magnets, magnetic assemblies etc. Our factory has over 19 years' manufacturing experience in making magnets with different shapes, different coating, etc. 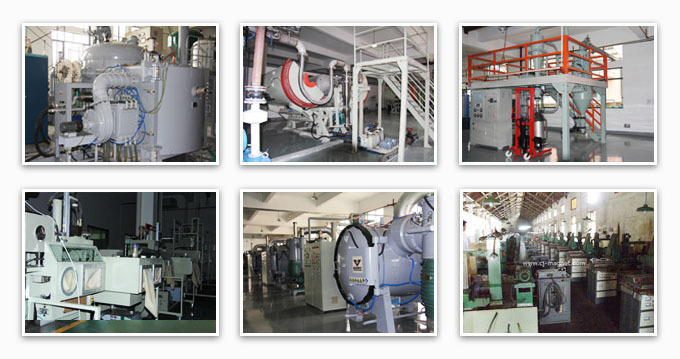 We have complete production lines including raw material melting, crushing, powdering, pressing, sintering, machining, plating, quality-inspecting,etc. Our annual design output is over 1000Ton, currently, actualy output is around 500Ton ,of which around 60% is for export market especially for West Euro, North America, Korea, Iran, India, etc. Our factory covers 10000 square meter, with employess 100 or more. We implement ISO 9000 idea in the factory over 7 years to keep steady quality level. We have over 10 years export experience so we can have good communication with customers and settle all kinds of export issues. Our average delivery time:10-20days. We are developing company specialized in magnets export for over 19 years, we have abundant experience in supply of good quality magnets as well as competitive price. near to Shanghai, Shenzhen port. So we enjoy the most convenient transportation by sea, by air, by express like DHL,FEDEX, UPS, etc. We mainly supply mid-high performance magnets like sintered neodymium-iron-boron magnets called as neodymium magnet, ndfeb magnets, strong magnets, permanent magnets, rare earth magents, and ferrite magnet, Alnico magnets, Smco magnets, rubber magnets, Magnetic Assembly, etc, . We have advantages in producing super-small (super-thin) magnets as well as special shape magnets , customized magnets, magnetic metal & plastic assemblies. Our magnets were exported to German, Italy, Spain, French, America, Mexico, Iran, Korea, Turkey, India, Russia as well as Hongkong, Taiwan. Our permanent magnets are mainly used for motor industry, acoustic industry, medical mechanic industry, free-energy home appliance,etc. Customer first, Quality first, Honest first. to help more people in the world who need help by investing on charity. 1. Good Quality: Our permanent magnets have highly consistent magnetic property and high temperature resistance, and are particularly suitable for all kinds of motors, electrical machinery, electric-acoustic devices, microwave communication, computer peripheral equipment, etc. Meanwhile, we can also supply products with good cost performance to cater for customers' purposes of home appliances, crafts, etc. We view quality as company's life. So we will not use bad material to cheat customers. 2. Leading Technology: We keep continuous technical innovation. We can supply produce High performance products and high temperature resistance magnets. Furthermore, we keep research on Multi-pole radial magnetization ring magnets for motors. 3. Good Credit Standing: We enjoy a good reputation in domestic and overseas markets. We were premium members of Made-in-china.com and Alibaba.com . We have been audited by third party. We cooperate with our customers with the strict direction of negotiation and contract. We aim to establish long term business relationship with customers rather than one-time business. Any cheating with lower quality magnets is not our company spirit. 4. Good Service: We can respond to you at the first time, even we have special online service for the international market.